My mind runs wild with possibility and with it there are a hundred or more paths it can run. There are concerns of school and children. Work and projects. Adoption and hearts living and beating clear across the ocean. Health and the days dwindling from summer to fall. In the right here, in the right now, my mind races to the tomorrows, following of that which concerns me today. I am laying on our former host daughter's bed staring at the ceiling; I had been attempting to meal plan in preparation for grocery shopping. I had recalled a book with lots of great recipes but before I could flip to that section my eyes landed on the page with a checklist for stress-related symptoms. In those few moments I checked off more symptoms than I cared to admit. I read intently the premise of the chapter. Stress reduces brain health, which in turn reduces other health. And not just of the physical body -- but health of the soul and of the heart. "You will keep in perfect peace all who trust in you, all whose eyes are fixed on you." My youngest son beckons me from my silent meditation to help him fix yogurt with super greens. I settle him at the dining room table and ask if he wants mommy company or if I should go back to spending quiet time with God. He smiles; you can spend quiet time with me and God, he offers. 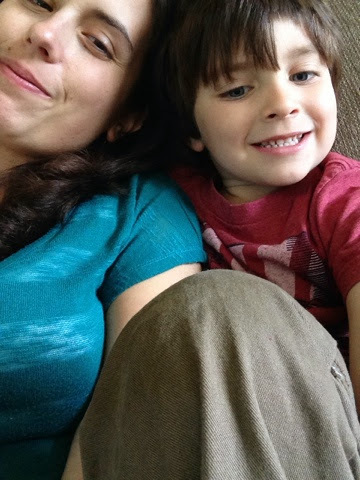 I laugh; quiet and time with my little guy is seemingly contradictory. I settle in next to him anyway. He slowly, quietly eats his yogurt and snuggles against me at the same time. I exhale and begin to understand that I was wrong; quiet time with him and with God is exactly the quiet my soul needs in the right now. Because in the right now, I notice the breeze is still warm and the trees are still green. In the right now, my youngest son is still small and snuggly pressed against my side body. In the right now, I feel breath coming through my lungs.